Denise comes on the podcast to talk about the latest happenings at FDSA (and boy is there a lot happening!) and then to chat about the differences between being goal oriented and process oriented. Which do YOU want to be? This is an excerpt from the book Cooperative Care: Seven Steps to Stress-Free Husbandry by FDSA Instructor Deb Jones, PhD. Available now! It is important to have a dedicated place in your home where you will practice the majority of your husbandry work. You want somewhere that your dog can easily recognize as a husbandry training location and that you don't use for any other purpose. This enables your dog to make decisions about whether or not he wants to participate, as well as understand what he can expect from you. A grooming table is an ideal place. It is clearly recognizable to your dog as a training place and the height will keep you from ending up with a backache from bending over. If you don't have a grooming table, any elevated surface, such as an ottoman, can work. Choose a surface that is solid, sturdy, stable, large enough for your dog to easily lie down, and that has a non-slip surface. Your dog will be spending a lot of training time there so it should be as comfortable as possible. The most important aspect of your training place is that you set it up so your dog has a way to get on and off by himself. This is what gives him the ability to leave if he's uncomfortable. You can set up your table next to a chair or other piece of furniture to make it possible for your dog to jump up and down safely. Occasionally, using an elevated surface simply doesn't make sense. For example, maybe you have a giant breed dog. In this case, it's a good idea to set aside a location with a specific floor covering to delineate the space. A foam yoga mat or some children's play tiles would make a good floor covering for your place. Again, make sure the area is large enough for your dog to lie down comfortably. Trapped inside with your pup due to heat or cold? Today we talk to Loretta about how to get in practice even when you don't have much space to work with. Today we talk science and fitness with Dr. Leslie Eide, and get the scoop her on her class all about cavalettis! In positive reinforcement training, a cue is something that indicates to the learner (your dog) that you would like her to do a certain behavior. Most cues in dog training are verbal or visual. 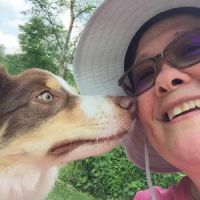 But cues can be olfactory (a dog training in scent work sniffs the odor and sits) or auditory (a click in clicker training), or environmental (you take your dog out of the car at the trailhead, and she knows she is going for a walk). A touch can also be a cue. The dog learns that when she hears, sees, smells, or feels the cue, and performs the correct behavior, she will earn a reward. Training your dogs with stinky fish on the field? Getting behaviors despite distracting environments (like a motorcycle show at the fair)? Yeah, Sara's done that! And she shares her tips on this weeks podcast! Thresholds & Dog Training: When is your dog actually over threshold? If you manage a stressed dog, you likely think about thresholds quite a bit. 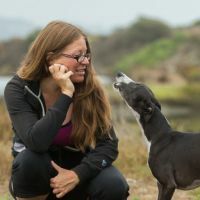 You think about whether your dog is "over threshold" in a given situation, and you may be continually planning how to keep him "under threshold" as much as possible. 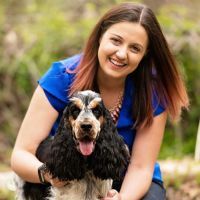 Even if you don't have a dog with a tendency toward fear, reactivity, or stress, you want your dog to be in an optimal emotional state for learning, and that may lead you to thinking about what might push your dog "over threshold" and cause you to have to switch gears. But just what is this "threshold?" As I've always said about Nosework, we are half the team! That means our success at a nosework trial has more to do with us than our dogs. There is so much involved — setting up training plans, handling, strategy and our nerves — we can make or break the search! Once our dogs know their job and have the skills, we need to focus on OUR skills and to glue it all together from start to finish to excel at a trial. If you've trialed recently, and were disappointed with the results, it's time to take a look at your own performance! 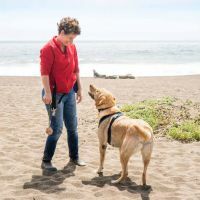 By reviewing our trial experiences we can 1) own our mistakes, 2) improve our handling, 3) learn to read our dogs better, 4) develop our mental game, and 5) set appropriate goals. Let's discuss each area in a little more detail. PODCAST E97: Positive Training 2.0 - How did we get here? Today we're doing something a little bit different - we're starting a new series called Positive Training 2.0. 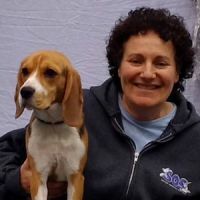 This week, we have on Deb Jones to talk about the world of positive training - how we got to where we are today and where she sees things going in the future. When I first got started competing in obedience, I really had no idea what heel position meant. I mean, I vaguely knew the dog should walk at your left side and sit when you stopped walking. I could tell that much from watching other teams heeling, even with my uneducated eye. It turns out that perfect heeling is a somewhat subjective thing. Everyone has their own aesthetic sense of what "perfect" means - their own picture in their mind of what perfect heeling should look like. Heeling was one of those things where I knew it when I saw it but I couldn't really tell you how to define it. Like art, music, fancy food, and other complex things, I could tell you when I liked what I saw, but I had no idea how to identify what made it great... and worse, I had no idea how to reproduce it. 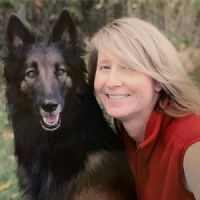 PODCAST E96: Trish McMillian - "Dog Body Language"
Today we talk to Trish McMillan about her experience working in shelters and with shelter dogs, as well as about some of the most overlooked dog body language cues you need to know! Editor's Note: This is adapted slightly from a post Sarah shared on facebook after a seminar with Julie Symons where she worked her dog Zoe. Included is video from that seminar, shared with both Sarah and Julie's permission. 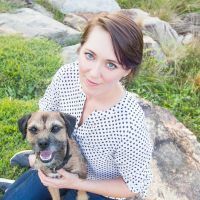 Author's Note: These tips are not only great for "sensitive" dogs, but can be adapted for all dogs. Thank you Julie Symons' for creating such a safe place for learning, and for being open to adapting exercises to suit Zoe's needs. This was a big deal for her! First impressions really matter. After these first couple exercises, she was literally pulling me into the building the rest of the day! 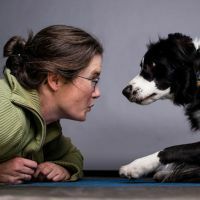 PODCAST E95: Leslie McDevitt - "Behavior Modification With Canine Consent"
Trying to put together how consent and behavior modification and positive training all work together? Leslie explains, in this week's episode of the FDSA podcast! A lot of time in dog training, we hear about the 4 D's: Duration, Distance, Distraction and Diversity. For example, in teaching Stays. Can your dog stay for a certain amount of time, at a certain distance from you, under certain distractions and in new places? It's easy to understand the 4 D's in this context. Nosework isn't any different! In fact, the 4 D's are essential to the foundational quality of odor obedience. Let's explore! Picture a search dog looking for narcotics. His sole focus in on finding the "dope." He works with intensity, ignoring things like dropped food. His only desire is the search. He's never been to that location, but he doesn't care; his focus is incredible. He leaves the handler because he's caught scent of some heroin in the garbage can. Now, his focus changes to the alert, signaling to the officer that he's made a find. 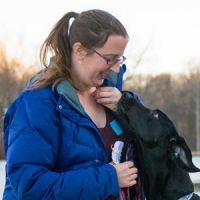 PODCAST E94: Alla, Andrea, & Sara - "Student Interviews: Dog Training is a Journey"
This episode is a little different than our usual weekly interviews; this time we turned to three long time FDSA students to talk to them about their training journeys and biggest training takeaways! Dogs are fun right? Showing, and seminars and workshops should be a time to relax and enjoy – the time we get paid back for all the hard work we do the rest of the time. A celebration of all that is good, as it were. We are learning, and sharing our passion with our best friends. Even through the stress and worry it's often glorious and educational and all the things we love most about having dogs in our life. Sometimes though it feels like we have Pavlov sitting on one shoulder ( aka bob bailey) and nerves and anxiety sitting on the other. Why not tackle the ring nerves and show stress head on and see what you can do to reduce them? Welcome to the Science Cafe! On December 10, 2018, three FDSA instructors with science PhDs hung out for an hour or two and talked science online. The subject: Hartley, Catherine A., and Francis S. Lee. "Sensitive periods in affective development: Nonlinear maturation of fear learning." Neuropsychopharmacology 40.1 (2015): 50. If you've been in dog training for a while you've likely come across the learning models of Operant Conditioning and Classical Conditioning. You can hardly pick up a training book anymore without either one or both being mentioned — and that is a great thing! However, if you aren't sure what each of these models is, you aren't alone. Each has potentially confusing concepts, and each governs a different part of our teaching experience with dogs. You're using them both all the time whether you understand them well or not, so let's get them sorted out, shall we?